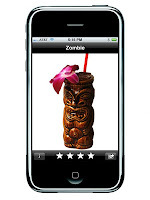 Please make the 101 Cocktails app compatible with the ipod Touch!! Thanks! It should work on iPod Touch 2nd generation. Does it not? Did you give up your blog in 2009? Nevermind, I just want to ask you about 101 Cocktails, which looks like a real fine app. But over here in Europe, we use the metric system, and you over there in America are supposed to use it, too. I see from the screenshots that the measures are - well I don't know what - "Imperial"? Non-metric, anyway. Can I toggle in the app? I will be sorely disappointed if you tell me there are no metric measures in the app. Good cocktails all. Thanks for the post.